Friday December 1st 1893 I worked on my mat some in the forenoon beside doing my other work. I went up town in the afternoon and up to Chalfants. It is very cold. Will is not at all well. Spent evening at home working on my mat. Otts birthday. 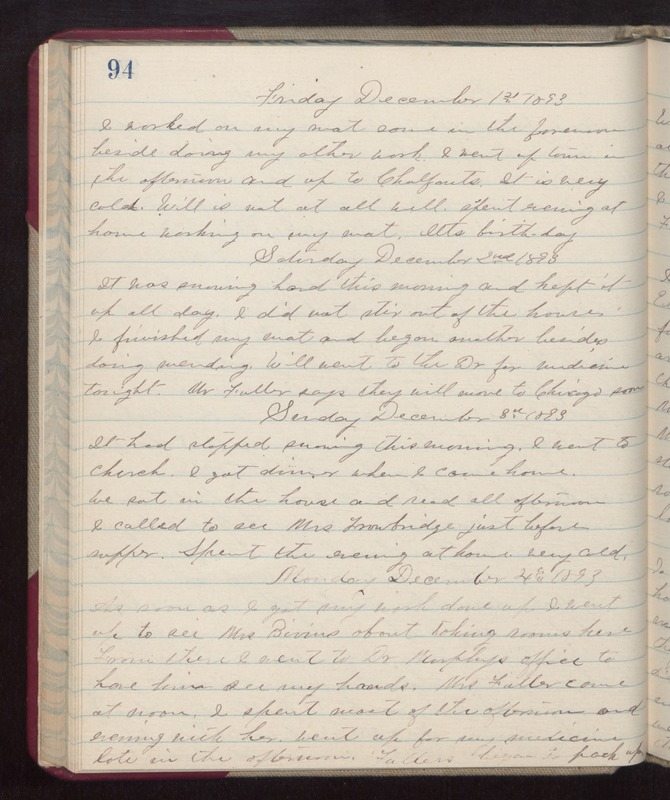 Saturday December 2nd 1893 It was snowing hard this morning and kept it up all day. I did not stir out of the house. I finished my mat and began another besides doing mending. Will went to the Dr for medicine tonight. Mr Fuller says they will move to Chicago soon. Sunday December 3rd 1893 It had stopped snowing this morning. I went to church. I got dinner when I came home. We sat in the house and read all afternoon. I called to see Mrs Trowbridge just before supper. Spent the evening at home. very cold. Monday December 4th 1893 As soon as I got my work done up I went up to see Mrs Bivins about taking rooms here. From there I went to Dr Murphys office to have him see my hands. Mrs Fuller came at noon. I spent most of the afternoon and evening with her. Went up for my medicine late in the afternoon. Fullers began to pack up.